We’d love your help. 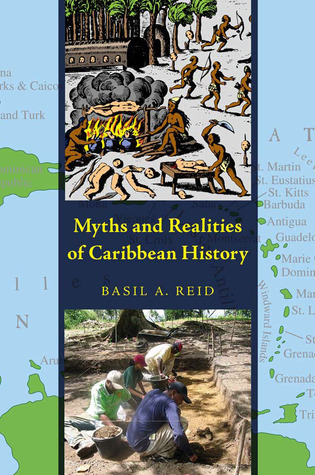 Let us know what’s wrong with this preview of Myths and Realities of Caribbean History by Basil A. Reid. This book seeks to debunk eleven popular and prevalent myths about Caribbean history. Using archaeological evidence, it corrects many previous misconceptions promulgated by history books and oral tradition as they specifically relate to the pre-Colonial and European-contact periods. It informs popular audiences, as well as scholars, about the current state of archaeologica This book seeks to debunk eleven popular and prevalent myths about Caribbean history. Using archaeological evidence, it corrects many previous misconceptions promulgated by history books and oral tradition as they specifically relate to the pre-Colonial and European-contact periods. It informs popular audiences, as well as scholars, about the current state of archaeological/historical research in the Caribbean Basin and asserts the value of that research in fostering a better understanding of the region’s past. To ask other readers questions about Myths and Realities of Caribbean History, please sign up. Wonderful information about the history of the natives of the Caribbean that had a long standing civilization when Columbus arrived in 1492. Great presentation of facts to dispel many of the myths that have been propagated over the years about the people of the Caribbean called by various names in history books. Lots of good maps of migration paths and archaeological sites that have been used by the author to build a case that the Caribbean natives engaged in trade with neighboring islands, along Wonderful information about the history of the natives of the Caribbean that had a long standing civilization when Columbus arrived in 1492. Lots of good maps of migration paths and archaeological sites that have been used by the author to build a case that the Caribbean natives engaged in trade with neighboring islands, along with South and Central America. It appears that when the Spanish needed more slaves to work mines or plantations they just declared the natives on the next island they encountered "savage cannibals". According to the rules of engagement that they were operating under from the Spanish throne this permitted them to enslave the locals.